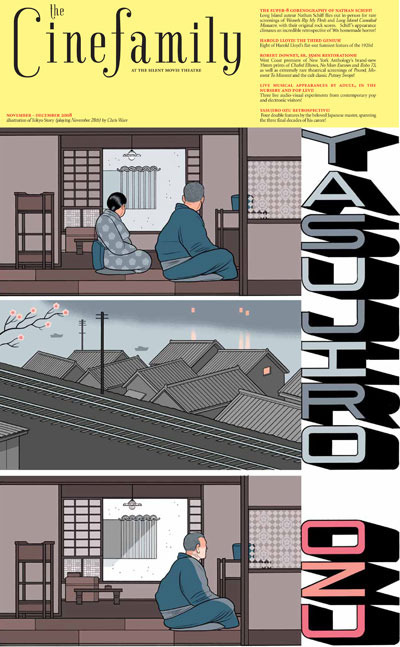 Check out Chris Ware’s lovely tribute to Yasujiro Ozu’s Tokyo Story on the cover of the November/December Cinefamily calendar. The Cinefamily shows its eclectic (“exceptional, distinctive, weird, and wonderful”) programs at Hollywood’s Silent Movie Theatre, whose co-owner, Sammy Harkham, is a comic artist and also runs a graphic arts bookstore, Doug Cummings tells us, on his Filmjourney blog. Which perhaps explains the unusual, and stunning, calendar commission!